Dr. Barber has been described as more like Dr. Martin Luther King Jr. than anybody else in our world today. He became widely known for his leadership of the Moral Mondays Movement in North Carolina and continues his work today in the national Repairers of The Breach Movement. UUA Presidents including both Peter Morales and Susan Frederick-Gray have marched with Dr. Barber in nationally significant efforts to change discriminatory laws and practices. His efforts touch the heart of our justice efforts. The book speaks through Dr. Barber’s voice. It describes his personal struggles that include twelve years of not being able to walk that started after he had become a pastor. The personal religious commitments and experiences that helped make him who he was are fully described. But the major focus is on the people, their communities, the changes needed, and how some of the significant changes were accomplished through morally motivated action. During our discussion of the book we will view videoclips from Dr. Barber’s presentation at the UUA General Assembly in 2016. We will focus primarily on the book at our first session Feb. 6 and include discussion of what Dr. Barber is doing today in our Feb. 20 session. New Book Club members are welcome at either the afternoon session (1-3 PM) or the evening session (7-9 PM) on both Feb. 6 and on Feb. 20, at BBUUC. 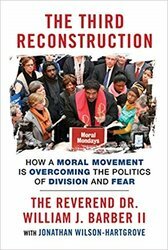 February: (UUA Common Read for 2016-17): The Third Reconstruction: How a Moral Movement is Overcoming the Politics of Division and Fear, by The Reverend Doctor William J. Barber II. Available at: http://a.co/d/9A5vtrx. March: (UUA Common Read for 2017-18): Centering: Navigating Race, Authenticity and Power in Ministry, edited by Mitra Rahnema. Available at: http://a.co/d/jkaQbCG. April: Hillbilly Elegy: A Memoir of a Family and Culture in Crisis, by J.D. Vance. Available at: http://a.co/d/aFvPSyo. May: (UUA Common Read for 2017-18): Daring Democracy: Igniting Power, Meaning and Connection for the America We Want, by Frances Moore Lappe’ and Adam Eichen. Available at: http://a.co/d/dH5XLnB. My life doesn’t seem to follow Buddhism’s first noble truth, that life is suffering. Yet even amidst my more abundant joys, even when I’m not suffering, there’s a sorrow that springs up in my life “like a … read more. You don't have to use a special login or enter a special code, just the link. This is probably the easiest fundraiser BBUUC will do over the course of the year. We are a participant in the Amazon Services LLC Associates Program, an affiliate advertising program designed to provide a means for us to earn fees by linking to Amazon.com and affiliated sites.